Zimbabwan Brighton Chipere has gone into history as the inaugural winner of the Mandela Day Marathon. 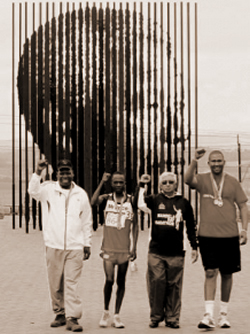 The first ever Nelson Mandela Day Marathon took place over the gruelling course from Imbali outside Pietermaritzburg, through Hilton to the Mandela Capture site outside Howick, KZN on Sunday 26 August 2012.
spirit of Madiba burning in me when I was running here", he added. Mandelas grandson, Mandla, an ANC MP, ran the 10km race. He said Mandela took fitness seriously and used to work out daily between 4am and 6am. "It is a message to South Africans and the global community that we should continue to stay healthy and fight obesity", he said. When you become a founder member of ENCO Foundation, you begin to make a difference for the causes you care about in Africa. Chose which outreach benefits from your endowment. Take our programs of your choice and sponsor them for one year. You do not need to have the money but you can chose to fundraise for it. we will give you the specifics. You can chose to just sponsor one program be it a month or a quarter. In addition, if you are a community organization in Africa with a program which you think will interest us, contact us. Every month we receive grant requests for viable sustainable programs. You can adopt a project by browsing through a portfolio of our approved projects.